Sweet basil seeds have played a role in the traditional medicine practices of India and Iran for centuries to treat conditions including depression, high blood pressure, high cholesterol and metabolic imbalances. The tiny black seeds also have the potential to help with blood sugar stabilization and satiation -- the ability to feel full -- when you're trying to lose weight. Reliable, consistent evidence that sweet basil seeds are a weight-loss miracle, however, is scant. You may include them safely as part of a weight-loss plan that includes a healthy, low-calorie diet along with more physical activity, but don't expect the seeds to suddenly shrink your size. Basil seeds have numerous names, including sabja seeds, tulsi, tukhamaria, takmaria, hairy basil seeds, holy basil seeds and Thai basil seeds. The weight-loss benefit of these seeds rests in their potential to suppress your appetite so you don't overeat at meals. Sweet basil seeds share the mucilaginous quality of chia seeds -- swelling to create a gel-like substance when mixed with liquid. This expanding ability and their high-fiber content are touted as weight-loss assets that fill you up without filling you out. Basil seeds also have very few calories and a mild flavor. Eat them mixed in a small amount of yogurt or water, and allow them to sit for 10 to 15 minutes so they swell up to 10 to 20 times their volume. No direct evidence exists to correlate weight loss and basil seeds. One small study conducted in 1992 showed that basil seeds consumed for 16 weeks before meals actually led to no change in body fat. You'll only lose weight using basil seeds if you make them part of a plan that involves reduced calories and exercise. Weight loss happens when you eat fewer calories than you burn daily. Basil seeds do potentially offer benefit in preventing weight gain in people with metabolic syndrome, a cluster of symptoms that precede the development of type 2 diabetes, or those with type 2 diabetes. Some research suggests that basil seeds also help moderate blood sugar levels, especially in people with type 2 diabetes, which can help with hunger and inflammation. 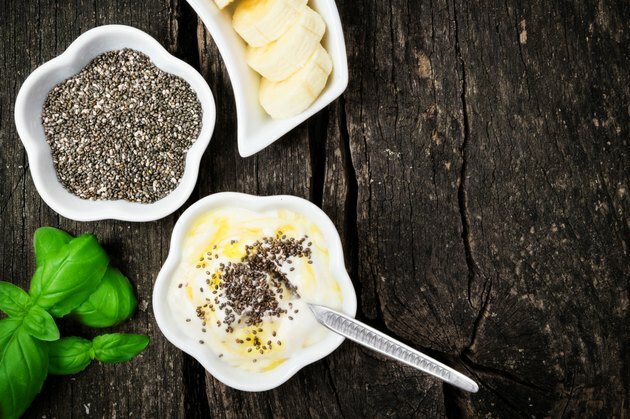 Animal studies have shown that consumption of basil seed extract may delay the development of insulin resistance and shows promise as a way to treat diabetic patients. Basil seeds' high fiber content likely slows digestion to prevent spikes in blood sugar, and subsequently the hormone insulin, following meals. You can safely add basil seeds to your diet with little fear that they will interact with any medications or supplements you're taking. However, do not expect their addition alone to induce weight loss. You must create a calorie deficit of 500 to 1,000 calories per day to lose 1 to 2 pounds per week. Use an online calculator to determine how many calories you burn daily according to your age, size, activity level and gender. Then, subtract the calories from that burn rate to determine how many you should cut from a balanced diet daily to drop pounds. Eating fewer than 1,200 calories per day as a woman or 1,800 as a man can backfire, however. You risk stalling your metabolism and losing valuable muscle mass. If cutting 500 to 1,000 calories per day puts you at these low levels of intake, revise your weight-loss goal rate and become more active to achieve the desired weight-loss deficit. Basil seeds offer other potential benefits. The fiber helps fight constipation, for example. Ayurveda -- an ancient practice of Indian medicine -- uses basil seeds for their antimicrobial, antiseptic value. Culinary enthusiasts seek out basil seeds for their slight floral taste and light crunch. You'll find them in recipes for Southeast Asian and Indian beverages, such as nam manglak -- a drink infused with rose water and honey. Basil seeds also appear in Indian desserts, such as falooda, a thick and sweet drink. These desserts and sweet drinks may not help you lose weight, but they could offer a filling, lower-calorie alternative to American soda, syrupy coffee drinks and milkshakes.